Come January, 11 percent of the members of the House of Representatives will be brand new — at an absolute minimum. They’ll be the 46 freshmen who have secured open seats, meaning their elections had nothing to do with anti-incumbent sentiment. Almost two-thirds of these newcomers are already safely packing for Washington. The elections of 15 Republicans and 14 Democrats are essentially assured Nov. 8, because they are nominees in open districts drawn to virtually guarantee the election of someone from their party. As a result, a portrait of next year’s House can be sketched with some certainty. The 29 fresh faces who are certainly on their way could make up almost half the Class of 2016, and maybe a solid majority. That’s because, in addition to the remaining seats without an incumbent on the ballot, but with at least some measure of competition, two weeks before Election Day, there are only 28 House members who appear in any viable danger of being replaced. So what do these freshmen-in-waiting look like? Collectively, they’ll have the same sort of effect on the House’s demographics as would the group of potential fresh faces in the Senate — subtle, but hardly transformational progress for a legislature that continues its two-century history of being much more white, middle-aged and male than the national population it’s chosen to represent. The guaranteed newcomers will make the House a bit younger and slightly more ethnically varied, although by themselves they will actually set back a few notches the steady progress toward gender parity in the chamber. If there’s a singular face for diversity breakthroughs in the group, it doubtless belongs to Lisa Blunt Rochester, a former Delaware labor secretary and personnel director, who is going to become the first woman and first African-American to represent the state at the Capitol. Almost half the states have never had a black member of Congress, but after she succeeds fellow Democrat John Carney (a sure bet to step into the governorship) in the state’s single House seat, Mississippi and Vermont will be the only states that have never seen a female in their congressional delegations. Among the six African-Americans who are certain freshmen, all of them Democrats, Blunt Rochester and two others will be replacing white lawmakers — paving the way for an increase in the number black members to a record 46. As a consequence of court cases that produced the unusual mid-decade congressional remapping of two states, and then departures by 10 incumbents, former Orlando Police Chief Val B. Demings in Florida and state Sen. A. Donald McEachin in Virginia will have no trouble securing districts drawn with sizable ethnic minority populations. 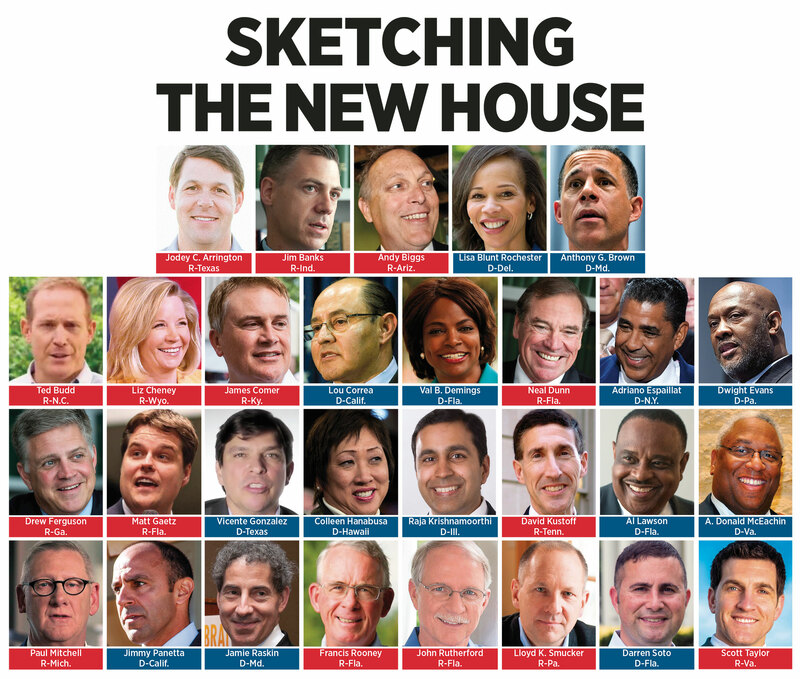 The roster of Hispanics in the House is on course to grow by two, to a new high of 31. That’s in part because the nation’s most important macro- demographic shift proved pivotal to victories in crowded Democratic primaries by two Latino state senators now in line to succeed non-Latino fellow Democrats at the Capitol. They are Darren Soto, who consolidated the burgeoning Hispanic vote and will replace the failed Senate aspirant Alan Grayson as Florida’s first congressman of Puerto Rican descent, and Adriano Espaillat, who capitalized on New York City’s evolving melting pot recipe to follow Charles B. Rangel, retiring as the second-longest-serving black congressman in history, and will become the first Dominican-American ever in Congress. Two new Democrats with roots in Asia are a sure thing, both succeeding Democrats with roots in Asia. In the suburban Chicago district that Thai-American Tammy Duckworth is vacating to run for the Senate, tech entrepreneur Raja Krishnamoorthi will become the first native of India elected in more than half a century. In Honolulu, Colleen Hanabusa is ready to return to the House as the successor to her predecessor, fellow Japanese-American Mark Takai, who died this summer. The biggest unknown about the demographic profile of the House in 2017 is the overall size of its female population. The available information may, or may not, prove prescient. Eleven women are leaving of their own accord, but only four of the virtually guaranteed newcomers are women: Delaware’s Blunt Rochester, Florida’s Demings, Hawaii’s Hanabusa and Liz Cheney, a State Department official when her father was vice president and the prohibitive favorite to become Wyoming’s solitary House member. Cheney’s presence as the only GOP name on the list is an exception that proves the rule about her party: Republicans still badly lag Democrats in the creation of a diverse congressional candidate pool. Fourteen of the 15 sure-bet GOP freshmen are white men, but only one woman (state Rep. Claudia Tenney in upstate New York) is the party’s nominee for a competitive open seat, and no women are challenging the handful of beatable Democratic incumbents. The end result is that the female membership of the House Republican Conference is about to decline a notch or two from today’s 22. But the roster of 62 women in the Democratic Caucus could grow by as much as 19 percent, to a potential high of 74. Although the roster of eight departures is so far offset by only three women surely on their way, it’s not out of the question they could be augmented by as many as 17 more — because females account for almost half the party’s nominees for open districts that could go either way and as challengers to vulnerable GOP House members. In some ways, the collective résumé of the 29 already-on-their-way members looks remarkably similar to the existing membership. The group reflects a religious makeup that’s diversifying a touch while remaining close to its traditional makeup. Just as in today’s House, Roman Catholicism is its plurality religion, with nine, and more than half (16) identify with other Christian faiths. But, since 18 Jewish members at most will be returning next year, the addition of Maryland Democrat Jamie Raskin and Tennessee Republican David Kustoff is notable. And Hanabusa will the second Buddhist while Krishnamoorthi will be the second Hindu. Central Pennsylvania Republican Lloyd K. Smucker is the only one of the 29 without a college degree. Fourteen have law degrees and two Republicans have medical degrees — Florida urologic surgeon Neal Dunn and Georgia dentist Drew Ferguson. The long-term decline in the number of veterans in Congress isn’t going to be reversed. One-sixth of the newcomers has been in uniform, the same share as in the exiting House. As is almost always the case, the incoming crop of House members will skew younger than their new colleagues. The average age of the guaranteed newcomers when they take office in January will be just under 52 and a half — four and a half years younger than the average age of the House members who began the current Congress in 2015. Florida has produced both the youngest and oldest members of the group: State Rep. Matt Gaetz, 34, who’s succeeding retiring fellow Republican Rep. Jeff Miller, and former state Sen. Al Lawson, 68, who ousted Rep. Corrine Brown in the Democratic primary after her 22-count corruption indictment. Lawson, who played in the 1970s for the Indiana Pacers and the San Diego Conquistadors of the old American Basketball Association, looks to be the only professional athlete in the 115th Congress. The biographical backstories of the for-sure freshmen offer only a relative handful of similar anomalies. The first gun store owner in modern times is coming to Congress, North Carolina Republican Ted Budd. Florida Republican Francis Rooney, whose construction company worked on the Capitol Visitor Center, also is a former diplomat who served as envoy to the Vatican a decade ago. But, in general, the roster is heavy with experiences that have proved the tried and true preparations for Congress. A majority, six Republicans and nine Democrats, have done time in state legislatures — topped by Democrat Dwight Evans, who’s becoming a federal legislator after 36 years representing Philadelphia in the state House. Two have held elected statewide office: Democrat Anthony G. Brown, Maryland’s previous lieutenant governor, and Republican James Comer, Kentucky agriculture commissioner until this year. Just two echo Trump’s résumé by having never held a position of public trust: Budd, who effectively secured a seat in Congress by garnering 6,340 votes in a 17-person primary, and Democratic attorney Vicente Gonzalez, who invested $1.6 million to claim a seat in South Texas. And Cheney, whose father held the Wyoming seat for a decade ending in 1989, will be joined by one other child of a prominent former House member. Democrat Jimmy Panetta will represent much of the same central California coast territory that his father, Leon, did for 16 years before leaving the Capitol in 1993 for a series of top jobs in the Clinton and later Obama administrations. Ryan Kelly, Tom Curry, Alex Clearfield and Andrew Menezes contributed reporting.